After the Al-Qa’idah "tease" - a media term hinting at a big story to come - that a new videotape from Al-Qa’idah leader Usamah Bin Ladin was about to be released, the group's propaganda arm finally posted it on an Islamist internet site. It's almost fraud. We analysts who study Al-Qa’idah and Bin Ladin were understandably excited when we heard the videotape tease. We were not excited about hearing Bin Ladin’s voice, but about the opportunity to see new video footage of the world’s most wanted fugitive. While there have been at numerous audiotapes from Bin Ladin since that time (today’s makes four this year alone), there has not been any available footage of Bin Ladin since October 2004. Most analysts regard the audiotapes as mere propaganda and proof of life. That’s all we have here – the usual rhetoric and proof that Bin Ladin was still alive on June 7, the date Az-Zarqawi was killed. The videotape - or more accurately, an audio tape with an old graphic - lionizes the late terrorist Az-Zarqawi. After Az-Zarqawi's death, there seems to be a concentrated effort on the part of the larger Al-Qa’idah leadership to project the image of a united front when it is apparent that there was a serious rift between the larger Al-Qa’idah organization and Az-Zarqawi's Al-Qa’idah in Iraq. In mid-2005, Az-Zawahri chastised Az-Zarqawi for his efforts to start a civil war in Iraq between the Sunni and Shi’a communities - an effort that continues to this day. Bin Ladin’s failure to release video always causes speculation about possible medical conditions, wounds, etc. Descriptions of his voice as weak and fatigued fuel that speculation. Some analysts are of the opinion that Bin Ladin cannot make a videotape, that he is in hiding and on the run, moving from hideout to hideout in the desolate Afghanistan-Pakistan border area. Possibly, but that has not prevented his deputy Ayman Az-Zawahri from making and releasing three videotapes this year. When there is only audio from Bin Ladin and video from Az-Zawahri, there is speculation as to his physical condition. If Az-Zawahri can make a videotape under those conditions, Bin Ladin can make a videotape. Why hasn’t he? The logo in the lower right is that of As-Sahab, the production element of Al-Qa'idah. The photo on the right side of the screen is Abu Mus'ab Az-Zarqawi and bears the logo of the Mujahidin Shura (Council). 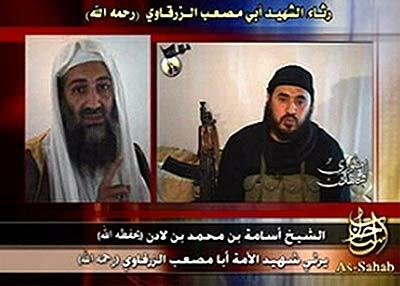 On the left, of course, is Usamah Bin Ladin. The Arabic text across the top reads: "Eulogizing the martyr Abu Mus'ab Az-Zarqawi (God have mercy on him)." The Arabic text across the bottom reads: "Shaykh Usamah bin Muhammad bin Ladin (God keep him) eulogizes the martyr of the (Islamic) nation Abu Mus'ab Az-Zarqawi (God have mercy on him)."